What to Do With All. Those. Tomatoes. 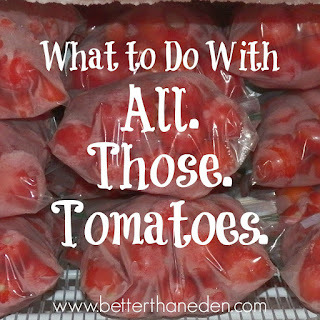 A few years ago I learned the simplest little truth about tomatoes that changed my world: you can freeze them. I know! It's true. For some reason when we began gardening and had our first bumper crop of tomatoes, I thought the only way to preserve them was to can them. I spent hours blanching, peeling, crushing, deseeding, simmering, making the sauces and canning. It was hard, hot, and tedious work and I would find it disappointing when a huge bushel of tomatoes would yield only a few jars of lackluster sauce. I think canning is a wonderful thing but the process for canning tomatoes is a bit more involved and time consuming than my miscreant and rebellious pear canning. It was my sister who let me in on her little secret. She just freezes them. So now that's what I do, too. I freeze the tomatoes and then use them the same way I use a can of stewed or diced tomatoes! The freezing process breaks them down so that they are mushy but that's okay because the majority of the time I need canned tomatoes it's for things like soups, sauces, or chili. I leave the skins completely on and usually they at least partially break down as they cook later. My husband is not a huge fan of the peels in the food but it's pretty simple to pick them out for those people of a more -ahem- pickier nature. The peels are where a lot of the nutrients and lycopene hang out so I think that's a great added bonus to leaving them in. After a few years of doing this I decided we would plant mostly all cherry and grape tomatoes this year with a few Roma (known for their sauce use) thrown in there as well. So this year we had an entire raised bed of cherry tomatoes. And then in several spots throughout the garden new tomato plants shot up from last year's tomatoes that had fallen to the ground so we got a bunch of random tomato plants as well. 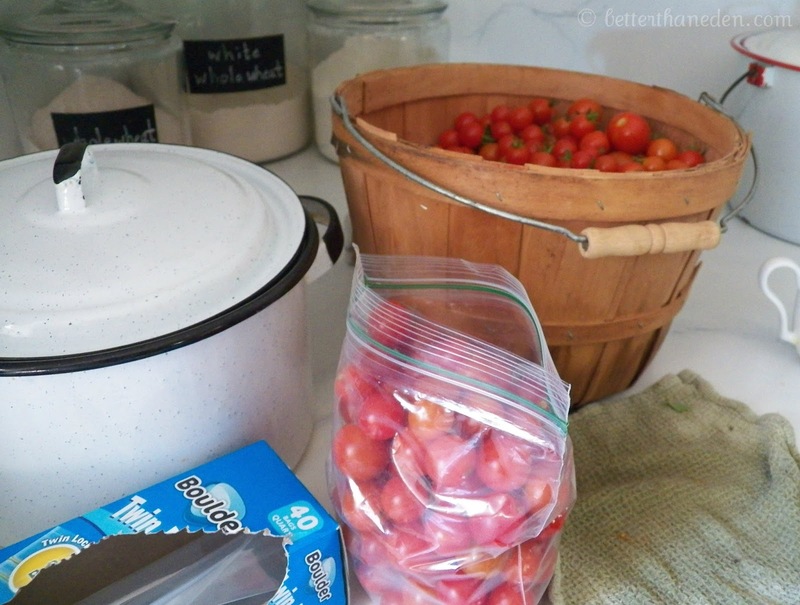 The cherry tomatoes pack into quart size freezer bags much more nicely and they contain less water than the larger varieties so there is less room taken up in the freezer by water that you're just going to want to simmer away anyway. Their peels are also smaller and break down more easily while simmering. I did still freeze some of the larger ones that came up and we couldn't use, though. There are maybe a few more details I should share. Obviously make sure they are clean. We grow our own so I'm not concerned about chemicals and most of them are clean straight from the garden. I'm not a dirtaphobe so I only do quick wipe with a damp rag of any dirt I see. If you wash, make sure they are completely dry before freezing. Oh, and remove the stem if it's on there. If you are using bigger tomatoes with a large core, cut that out first. When you cut out the core, you may create enough of a break to peel off some of the peel right then. Do that if you want but you can take the peel out while it simmers or just leave it in altogether. I freeze the mushy ones and the split ones as well. As long as they don't have any grossness to them, they get frozen. And really, that's it. Use them just as you would stewed or diced tomatoes in any cooked recipe. I usually estimate that a one quart bag of tomatoes is about 2 cans of diced or stewed in recipes but I sort of just wing it as well. Bigger tomatoes are going to have more of the water that is normally discarded in the canning process so it may add some simmering time when you end up cooking. Preserving tomatoes this way has taken a whole lot of stress and time off the process and it is so incredibly easy. Plus it should keep us in tomatoes for most of the winter. And with the cooler weather already making its way in, I'm already looking forward to our first batch of chili! WHAT?? How did I never know this?? And you really don't have to blanch then?? Even though I think our garden may only yield one or two bags full after we've eaten what we want, I'm still going to try this. Thanks for the tip! I didn't know this either! But then again, I don't grow anything. And yeah, we only have the standard freezer that comes with our fridge for our soon-to-be family of EIGHT! How are we surviving, I don't even know! I froze some last year and still have them because I never think to use them! Maybe I should move them from the outside freezer into the inside. Oh, I think I need one of those. That is REALLY cool. I agree this is so much easier than spending hours canning in a hot kitchen! Although I did can diced tomatoes this year- I will freeze the rest and use as crushed or whole tomates as needed- so much easier!!!! Exactly what I do with them too - just wash and bag them! So easy! 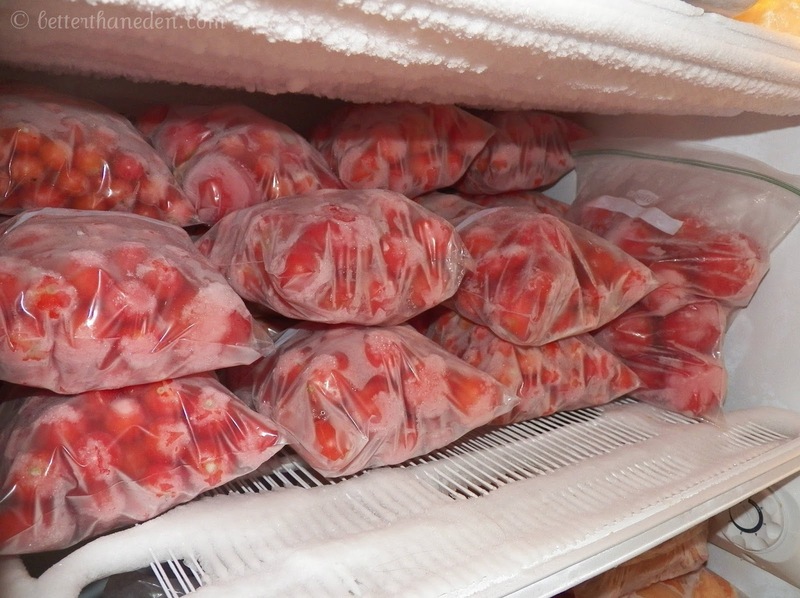 Wish i had so many tomatoes I had to freeze them! You know, I was thinking about freezing if we can go back and pick more. And then I thought, "All those plastic bags! I wonder if there's a better way... Mary would know!" 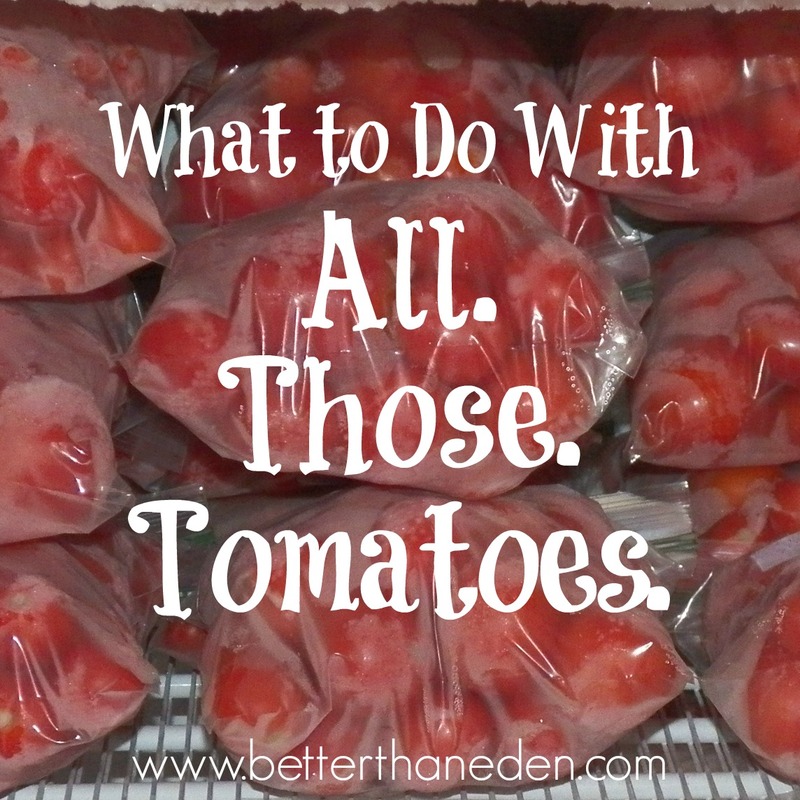 And THEN you wrote this post and I realized that if MARY uses plastic bags, it's okay for me not to go find a trillion more mason jars to freeze my tomatoes! Also, I just use an immersion blender to make my sauces and the peels AND seeds totally disappear. But I don't like chunky sauces, so it's smoooooooth smooth smooth. Thank you for this! I did a ton of canned tomato/apple chutney but have more tomatoes than I know what to do with! This is perfect! Thank you. Thank you. Thank you. You made my day with this!!! I was not looking forward to the canning process for the tomatoes...,, and was feeling bad about not eating the split ones. Thank you. Thank you. Thank you. I think this may have changed my life!!! Freezing is the best :). Until you run out of freezer space, and have to can anyways :S. I get this crazy amount of satisfaction looking at all my jars lined up on my Shelves though, am I the only one? The rest of my comment didn't post :(. Anyways, we also made salsa ans had to can that as well. So so so satisfying though, there is nothing better in the middle of February!